Setting up the QuickBooks Web Connector to work with CustomCart Standard Edition, CommerceSuite, or GiftSuite ecommerce software is quick and easy. 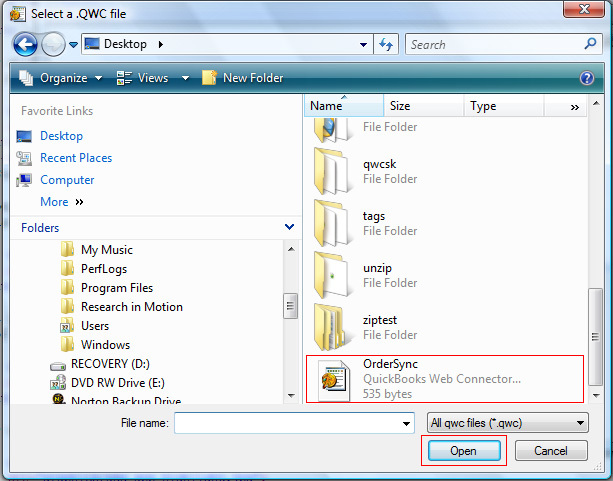 The web connector is a small program that works with QuickBooks to allow web-based ecommerce software to exhange data with QuickBooks. It is this web connector software that requests data from your Agenne web-based ecommerce system. This is the Intuit page where the free web connector software is located. 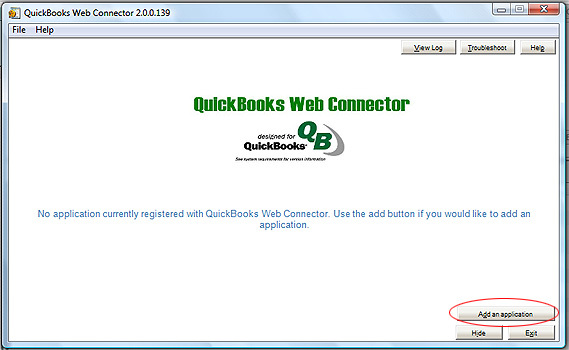 Follow the instructions provided by Intuit to download and install the web connector software on your computer. This will bring up your browswer's file download dialog box. 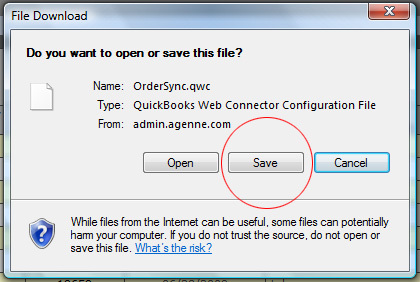 When this box appears, choose "Save", and put the file somewhere on your computer where you can easily find it, such as on your desktop. This is the OrderSync application file. To begin this step, start QuickBooks on your computer and open your company file. In some versions of QuickBooks, this will be automatic while in other versions, you may have to open your company file manually. When your company file is open in QuickBooks, click the "Update Web Services" menu item in the File menu. Now, add the OrderSync software to your QuickBooks Web Services system by clicking the Add an Application button in the lower right corner of the QuickBooks Web Connector screen. This will bring up a File Open Dialog. Navigate to where you saved the OrderSync application on your hard drive. Highlight it and click Open. 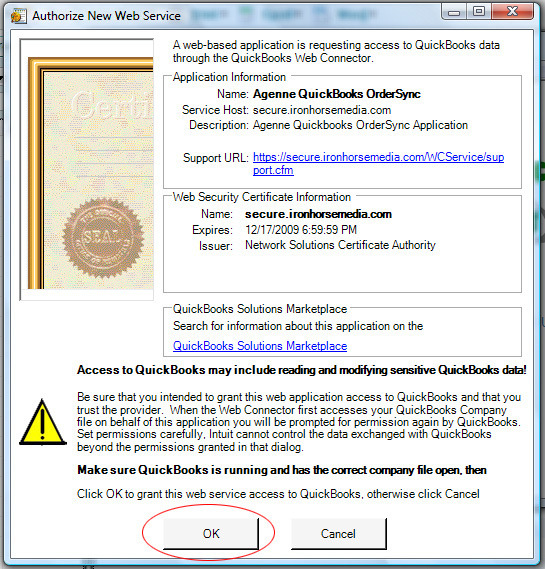 Next, you will see the Quickbooks application authorization screen with the OrderSync application asking for authorization. Click the OK button. Enter your Administrator password into the password field. This is the password that you use when you log in to the administrator. Note: If you change your password in the Administrator, you will need to change it in the QuickBooks Web Connector window. 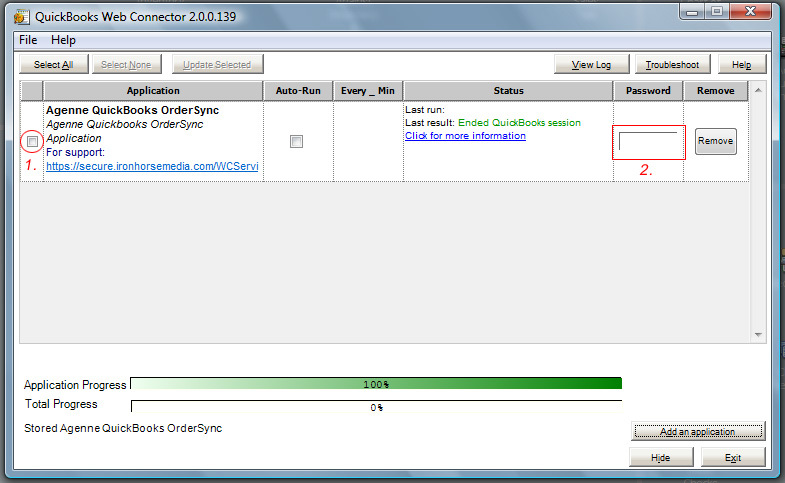 Step three is now complete and you have successfully setup the OrderSync application with the QuickBooks Web Connector. Back in the administrator, make sure you are still on the QuickBooks OrderSync page where you see all of your web site orders listed. At the left of each order, you will see a checkbox. This checkbox indicates whether the order has been downloaded into Quickbooks. Since you may already have most or all of your orders in Quickbooks, you will need to manually set the status of each order. If most or all of your orders are already downloaded into QuickBooks, click the "Check All" link at the top of the page. Then uncheck only those orders that are not already in QuickBooks. 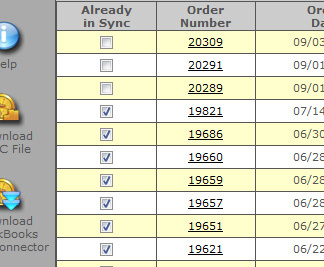 When you have your initial order list set correctly, click the Update Sync Status button at the top of the list. After you have set the initial status of each order, OrderSync will keep this list updated automatically and you should not have to do anything further to it. If you ever delete an order from QuickBooks and need it downloaded again, simply return to this page and uncheck the checkbox next to the order. OrderSync will download the order the next time that it is run. 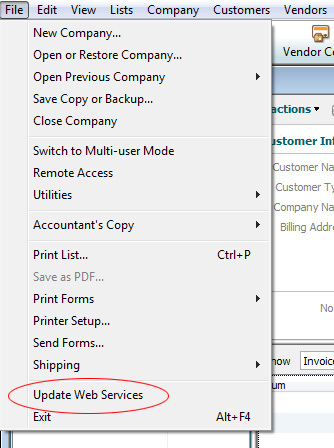 Once the OrderSync application has been setup with the QuickBooks Web Connector, and you have unchecked the checkboxes next to each order that you want to download into QuickBooks, go back to the QuickBooks Web Connector and click the Update Selected button. You will see the progress bar at the bottom of the window advance and various messages will be displayed. NOTE: This process takes time - be patient while your customers and orders are downloaded. Automatic downloading of orders based on a timer setting. If you want QuickBooks to download your customers and orders throughout the day while orders are coming in instead of doing it manually, you can set it to run automatically. To set the QuickBooks Web Connector automatic timer, check checkbox in the Auto-Run column and select the number or minutes to wait between downloads. The default setting is 60 minutes.